Outcome in elderly patients with aortic stenosis undergoing hip fracture surgery. Results may suggest a different postoperative strategy? Background Five to ten percent of patients with hip fracture have severe aortic valve stenosis (AS). The aim of the present investigation was to evaluate the impact of AS on early and long-term outcome after surgery for hip fracture. Methods 145 patients with AS and 283 consecutive patients without AS (control group) aged >70 years referred to Azienda Ospadaliera Universitaria (AOU) Careggi for hip fracture were included in the study. The endpoints were incidence of postoperative myocardial infarction, 30-day and 1-year mortality, and a composite endpoint (30-day mortality + myocardial infarction). Results 66 patients had mild, 47 moderate and 32 severe AS according to the European Society of Cardiology guidelines. 30-day mortality was 6.2% in AS and 3.1% in controls. Postoperative non-fatal myocardial infarction and composite endpoint were more frequent in AS than in the control group (8.3% vs 1.1%, p<0.001 and 14.5% vs 4.2%, p<0.001, respectively). The risk was significantly higher for patients with severe AS (28.1%). 1-year mortality in patients with moderate/severe AS was 46% in comparison with 16% in mild AS or in the control group (p<0.001). Coronary disease, atrial fibrillation, age, and aortic gradient were independent predictors of mortality in AS. Discussion AS significantly affects postoperative outcome after surgery for hip fracture. Since not infrequently AS is incidentally diagnosed during hospitalization after trauma, which should be the management in these patients after hip surgery? How many might benefit from surgical valve replacement or transcatheter aortic valve replacement? A heart team evaluation may be suggested before discharge for most of these patients. Among the common urgent-emergent non-cardiac surgical procedures, hip fracture treatment has a prominent epidemiologic role. The incidence of severe AS in patients who need surgery for hip fracture is between 5% and 10%.6 Although after hip surgery 30-day mortality in severe AS is between 7% and 14%,7–9 these data may be an underestimate since the diagnosis of AS is not uncommonly missed before surgery. In fact only few centers have an echocardiography service that may allow assessment of AS severity without delaying surgery. Few retrospective studies7–9 examined the prognostic role of AS on in-hospital and mid-term survival in this high-risk group of patients. In January 2012, the Florence Trauma Centre created a multidisciplinary hip fracture unit to assess the preoperative risk, guide anesthesiology strategy, and direct postoperative management.10 The goal of this group was to stratify the risk before surgery, prevent and treat early complications, decrease perioperative mortality, and improve life expectancy and quality of life. The aim of the present investigation was to prospectively evaluate the impact of AS on early and long-term postoperative outcome in patients undergoing surgery for hip fracture referred to the Florence Hip Fracture Unit. The study is part of a project of the Italian Health Ministry and Regione Toscana (RF-2010–2316600). All patients gave written informed consent to treatment and collection of clinical data for research purposes at admission. The study was conducted according to the Strengthening the Reporting of Observational Studies in Epidemiology statements. At hospital admission all consecutive patients with isolated hip fracture referred to the Florence Hip Fracture Unit underwent careful clinical evaluation to stratify surgical risk, allow scheduling of early surgery, and choose anesthesiology strategy. Functional status before surgery was assessed according to the Barthel Scale.11 The degree of cognitive impairment was assessed using the Short Portable Mental Status Questionnaire.12 Bedside transthoracic echocardiography was performed with a portable machine (Esaote MyLab V.40, Firenze). We measured left atrium diameter, left ventricle dimensions, and left ventricular ejection fraction (LVEF). The degree of mitral and aortic regurgitation was expressed as semiquantitative values. Peak and mean aortic valve gradients were measured by continuous Doppler. Aortic valve area (AVA) was calculated by continuity equation using velocity time integral (VTI). Severity of AS was defined according to the guidelines of the European Society of Cardiology13: severe (AVA <1 cm2), moderate (AVA 1–1.5 cm2), and mild (AVA >1.5 cm2). Pulmonary systolic pressure was calculated adding right ventricle/right atrium (RV/RA) pressure gradient to the estimated right atrial pressure assessed by inferior vena cava diameter and response to respiratory acts. ECG and laboratory examinations, including troponin I assay, were performed before and at 12, 24, and 48 hours after surgery. Deep venous thrombosis prophylaxis with low molecular heparin was started as soon as possible. Patients on chronic warfarin therapy were considered for drug withdrawal and oral vitamin K administration to recover normal clotting parameters. Perioperative diagnosis of acute myocardial infarction was made according to the criteria proposed by the Third Universal Definition of Myocardial Infarction.14 Follow-up was conducted as outpatient visits at 3 and 12 months after surgery. Categorical variables are reported as frequency and percentage. Values for continuous variables were given as mean (±SD). Categorical variables were compared using the χ2 test or the Fisher’s exact test. Two-tailed Kaplan-Meier curves were used for survival analysis. Differences between groups were compared using log-rank test. After univariate analyses, a logistic multivariable regression analysis was performed to identify the independent predictors for mortality. Because of multiple testing, only variables with two-sided p<0.05 in the univariate analysis were accepted in the model. Statistical analysis was performed using a statistical software program (SPSS version 22). A probability value of <0.05 was considered statistically significant. The study enrolled 145 patients with hip fracture and AS confirmed on echocardiography before surgery and who were admitted to AOU Careggi between January 1, 2102 and June 30, 2015 (14% of overall patients were referred for hip fracture in the whole period). Sixty-six (45.5%) had mild AS, 47 (32.4%) moderate AS, and 32 (22.1%) severe AS. All patients referred for hip fracture between January 1, 2014 and June 31, 2014 underwent echocardiography at admission: 283 had no aortic valve disease and were considered as the control group of the present investigation. The clinical characteristics of patients with AS, stratified according to severity of valve disease, and the controls are reported in table 1. The groups did not differ in age and gender. In patients with AS, history of heart failure, coronary artery disease, and atrial fibrillation were significantly more frequent than in the controls. This was more evident in severe AS. Finally the presence of ≥2 comorbidities was nearly twofold more common in patients with AS than in the controls (65.5% vs 33.9%; p<0.0001). More relevant results of preoperative echocardiography are reported in table 2. Moderate to severe mitral regurgitation, higher values of systolic pulmonary pressure, and higher degree of left ventricular hypertrophy were more frequently associated with severe AS. LVEF was not significantly different between the three groups with AS and controls. Surgery was performed within 48 hours from trauma in 75% of patients of the control group in comparison with 55% of the AS group, in whom the time to surgery was on average 12 hours longer. Since all patients underwent bedside echocardiography at the time of clinical evaluation for risk stratification, the delay to surgery was attributable only to the need for clinical stabilization or availability of intensive care unit (ICU) for postoperative monitoring. Preoperative diagnosis of severe AS changed the anesthesiologist and clinical approach. In 90% of patients with severe AS, surgery was performed under general anesthesia and arterial line was positioned for continuous hemodynamic monitoring. Fifty-six percent were scheduled for ICU monitoring in the 24 hours after the intervention. Only 5% required ICU for hemodynamic instability. According to the criteria reported in the Methods section, 12 patients with AS and 4 in the control group had postoperative myocardial infarction (8.3% vs 1.1%; p<0.0001) (table 3). None was fatal. 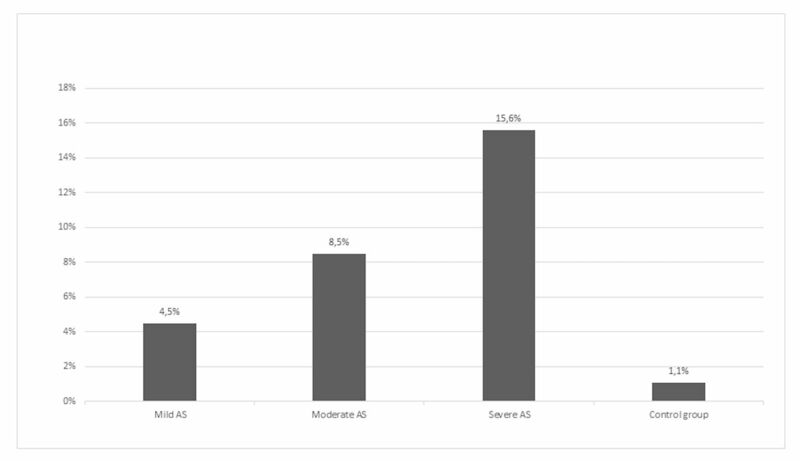 The incidence of postoperative myocardial infarction showed a relation with the severity of AS (15.6% in severe AS, 8.5% in moderate AS, and finally 4.5% in mild AS; p<0.0001) (figure 1). Incidence of postoperative myocardial infarction according to severity of aortic stenosis (AS) and in the control group. At 30 days overall mortality in patients with AS was 6.2% (9 of 145), twofold higher in comparison with the control group (3.1%). Composite endpoint (30-day mortality + myocardial infarction) was found in 14.5% of patients with AS in comparison with 4.2% of the control group (p=0.001). Incidence was significantly higher in patients with severe AS in comparison with moderate and mild AS (28.1% in severe AS vs 10.6% in moderate and mild AS; p=0.001) (table 3). The length of hospital stay was not significantly different in patients with AS in comparison with the control group. Postoperative heart failure was significantly more frequent in patients with AS (15% in patients with severe disease). Noteworthy, a higher incidence of postoperative delirium was found in patients with AS in comparison with the control group (29.7% vs 19.8%; p=0.0160) (table 4). One-year mortality was significantly higher in moderate/severe AS in comparison with mild AS and control group (46%, 16%, and 18%, respectively; p<0.001) (figure 2). On multivariate analysis pre-existing coronary disease, atrial fibrillation, increasing age, and aortic gradient were independent predictors of mortality in patients with AS (table 5). 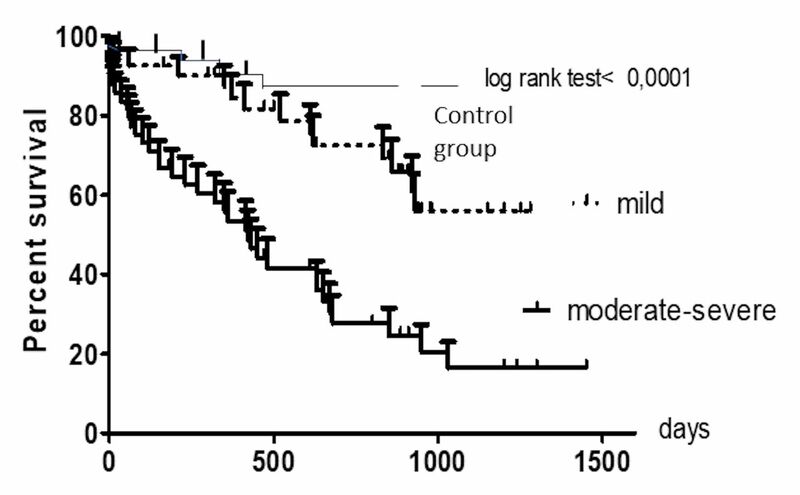 Kaplan-Meier survival curves in patients with moderate-severe AS, mild AS, and the control group. AS, aortic stenosis. The Scottish Intercollegiate Guidelines Network guidelines in 200916 suggested that echocardiography “should be performed if AS is suspected, to allow confirmation of diagnosis, risk stratification and any future cardiac management.” However, they also state that the need for echocardiography “should not delay surgery unduly” and that if delays are to be avoided “rapid access to an echocardiography service is recommended.” The cost of setting up and maintaining such a service may be offset by reducing delays and improving outcomes. Nevertheless, despite these recommendations, only a negligible proportion of patients with hip fracture undergo preoperative echocardiography, and the diagnosis of AS may be missed before surgery with an increase in perioperative risk. In our study, physical examination revealed a systolic murmur in almost all patients with AS; however, only echocardiography allowed evaluation of the severity of aortic obstruction and choice of anesthesiology strategy to decrease perioperative risk. Twenty percent of patients with mild systolic murmur were found to have severe AS (valve area of <1.0 cm2), thus leading to change in perioperative strategy. In a retrospective case–control study by Keswani et al,8 65 subjects with AS and hip fracture were matched to 129 patients with hip fracture without aortic valve disease. Thirty-day and 1-year mortality were significantly higher in the AS group (14.7% vs 4.2% at 30 days and 46.8 vs 14.1% at 1 year). Moderate/severe AS and chronic kidney disease were the only independent predictors of 1-year mortality. In the study of McBrien et al,9 272 patients with hip fracture and previously undiagnosed AS were compared with 3698 patients with hip fracture and no AS. Patients with severe AS were more frequently treated under general anesthesia (66.7%) and had arterial line positioning for continuous hemodynamic monitoring. Thirty-day mortality was 10% in severe AS in comparison with 6.25% in moderate AS and 7.4% in the control group, whereas 1-year mortality in the three groups was 36,7%, 21.9%, and 22.2%, respectively. The authors reported that time from trauma to surgery was not significantly different in patients undergoing echocardiography for diagnosis of AS and in control patients (average 5 days). The results of our prospective investigation confirm that in patients with hip fracture AS is associated with a 30-day, but in particular 1-year, poor outcome. Mortality at 30 days was slightly lower than previously reported.7–9 The different perioperative management (higher percentage of patients underwent general anesthesia and were followed in ICU in the first 24 hours after surgery, the mean time to surgery was only 12 hours longer than in the controls) and the different clinical characteristics of populations under examination may explain these findings. Postoperative myocardial infarction was significantly more frequent in patients with AS, in particular with severe disease; however, in our experience, none was fatal. Patients with valve disease had a more frequent history of coronary disease before trauma other than relevant left ventricular hypertrophy. It is likely that in these patients surgery-related hypotension (blood losses higher than expected, effects of anesthesia) may lead to inadequate coronary perfusion and to myocardial damage despite continuous hemodynamic monitoring and fluid management. In patients with moderate/severe AS, mortality at 1 year is close to 50%. Since in patients with hip fracture AS is not uncommonly diagnosed by chance during preoperative evaluation, a question that at present is without an answer is how these patients should be managed after hip surgery. Transcatheter aortic valve replacement (TAVR) is currently considered the standard of care for patients with severe AS who are considered at high prohibitive risk for surgical aortic valve replacement.17 Clinical characteristics in elderly patients with AS with or without hip fracture are not significantly different.18 Frailty is a common feature in patients with hip fracture; however, this condition is very prevalent (up to 80%) also in patients undergoing TAVR.19 20 In our opinion referral to a “heart team” of patients with AS after hip surgery, which may not be delayed, might allow identification of those who may benefit from aortic valve replacement to improve long-term survival and quality of life.21 Only a large multicenter trial may have the number to verify this hypothesis. For patients with AS who need urgent non-cardiac surgery such as those with hip fracture, at present data are limited but suggest a significant overall mortality in comparison with patients without valve disease. AS in these patients is often previously undiagnosed, and only preoperative careful evaluation with echocardiographic examination may reveal its presence and severity. AS is usually associated with a higher risk of perioperative death and myocardial infarction. Preoperative detection of valve disease may lead to changing anesthesiologist strategy (from spinal to general anesthesia) and adoption of close hemodynamic monitoring that may limit perioperative complications, as suggested by the relatively low 30-day mortality in our study. Long-term prognosis in these patients treated with medical therapy, however, is poor. TAVR may therefore be a therapeutic option in selected patients. In our opinion referral to a “heart team” of patients with AS after surgery for hip fracture might allow identification of those who may benefit from aortic valve replacement to improve long-term survival and quality of life.
. Validity of the 5-item Barthel Index in the assessment of physical dependence in the elderly. Asian J Gerontol Geriatr 2015;10:79–82.
. Epidemiology of fragility fractures in Italy. Clin Cases Miner Bone Metab 2011;8:29–34. Scottish Intercollegiate Guidelines Network Management of hip fracture in older people A national clinical guideline. 2009. sign.ac.uk/pdf/sign111.pdf. Contributors The conception and design of the study, acquisition of data, or analysis and interpretation of data CR, AC. Drafting the article or revising it critically for important intellectual content by GP, CR, AC and final approval of the version to be submitted by CR, AP, AB. Funding This study was funded by Ministero della Salute e Regione Toscana (RF-2010-23166x). Ethics approval The study was approved by the Ministero della salute e Regione Toscana.